I sometimes feel all is hopeless, I am doomed to eat potato chips the rest of my life. 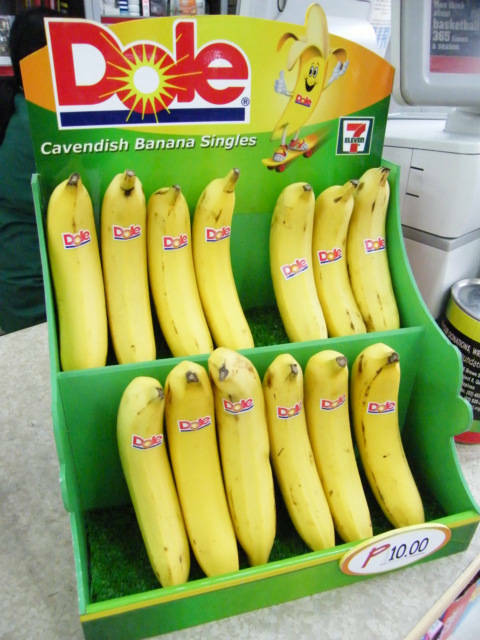 Thank you Dole Bananas and 7-11 Convenience Stores for giving me some Bananas to eat. This photo is from a 7-11 Convenience Store in the Ermita Area of Manila, They are selling Bananas for 10 Peso or about 25 cents per banana, and I can purchase one banana without them getting angry. I am single, not married, to buy bananas even in the market is annoying, they do not like me to rip off two or three, and one is totally a great way to get them annoyed. I walked into the Robinson Mall grocery store and asked, can I tear off three Bananas and buy them, they said yes. However, they are marketing and selling the bananas in clumps of six and above, the are not encouraging anyone to buy one. Not having a family is a continue hassle, and the restaurants of the world continually have less and less fruits or vegetable on the set meals. Whatever the motives here, I appreciate 7-11 to allow this display, and there is a 7-11 logo on the display, so this is a joint venture. Dole is helping the store to sell bananas. This is a very serious problem, malnutrition is rampant in many of the modern countries as they find the convenient food easy to buy like potato chips and bananas become more difficult to purchase. A person can be very fat and have malnutrition, the earmark is when a person has skin sores, and other infections that do not heal rapidly. The Philippines is great mix of extremely modern convenience, and the other side of life in one place. I enjoy coming to the Philippines to see what is going on in the USA. Life is very convenient in the Philippines, easy to buy about anything I could ever dream of, same as the USA, this is great. There is also many gyms or places to exercise in the Philippines.